Monday’s slow-motion selloff didn’t generate much fear, but it likely exhausted sellers for a while. Although I’ve put out a somewhat lower target in the E-Mini S&Ps for Tuesday, the big moves in the FAANGs appear to be over, or very nearly so. Rick’s Picks had been using a 1496 downside target in AMZN that came within a millimeter of catching the exact low of a so-far $68 bounce. (Click on the inset to see this graphically.) DaBoyz looked like they might want to revisit the low Monday evening, but they are going to have difficulty pushing the stock significantly beneath it, if even merely to it, since it’s such a clear and compelling Hidden Pivot support. 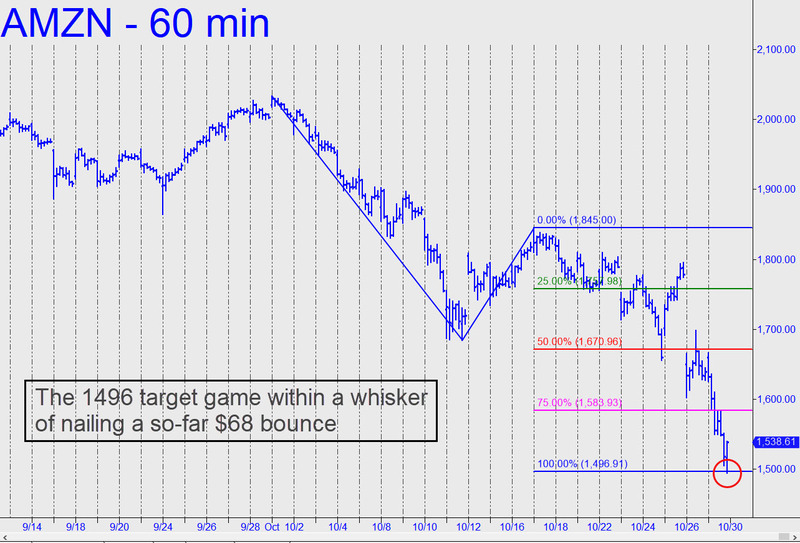 Similarly, AAPL hit a longstanding downside target at 208.04 before trampolining more than $6 from just beneath it. A relapse is unlikely to exceed the low by much, if at all, and that’s why the issues I refer to as the ‘lunatic stocks’ — i.e., the ones most heavily owned by portfolio-managing chimpanzees — should be supportive of the broad averages over the near term. The Most Hated Bull Market Ever is a media put up job, as it is just the opposite in knowing the stats that the pubic ‘is and has’ been all in for quite a few years. This is seen by House hold holding of restate and equities, and the all time cash levels in stock accounts. The INDU in this short wave lower of 18-22 trading days has about 3% +/- from yesterdays low point on the table lower before a counter trend process. Inverse markets as in 2000 and 2007 are the new investment field as they begin a very long climb upward over the next few years. A more climaxed lower pricing event is dead ahead in the coming months even before year end. Dates …..are important to observe.